Click on the photos for larger views and captions. 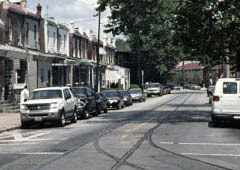 In the decade since Callowhill Depot was made "temporary bus," residents of two blocks of 59th Street have grown accustomed to using the western curb lane of the street to park their cars. Because the northbound rails on 59th Street are located in the exact center of the street, streetcars cannot pass without obstructing southbound traffic. So in order for streetcar service to resume from the newly renovated Callowhill Depot, one of two things must happen. Either the painted centerline of 59th Street must be moved to the side to include the rails (and parking prohibited on the west side of the street), or 59th Street be made one-way north. The City of Philadelphia is willing to do niether. Incredibly, the return of streetcars to Girard Avenue, for which years of planning and $82 million has been spent, has been in limbo since June 2004. 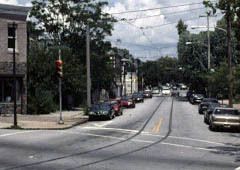 Update September 4, 2005: Trolley service on Route 15 Girard Avenue resumes.